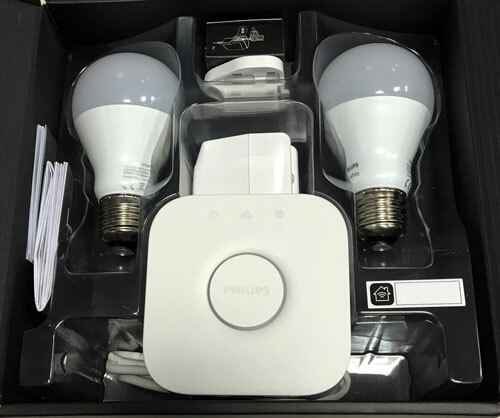 This Philips Hue kit currently costs £59.99 for 2 x Hue White LED bulbs plus the new v2 hub that supports Apple HomeKit. As the hub is normally £49.95 on it’s own that’s good value. You can buy more of these white 9w LED Hue bulbs at £14.99 and at that price there’s no need to even consider the cheap 3rd party alternatives (and the moving goal posts regarding their support from Philips). We installed them at the Automated Home, connecting the Hue hub and the bulbs to our SmartThings system. Also check out this £29.99 kit of bulb and remote which is great for retaining local control in the room. Now all we need is a cheaper colour version too – come on Philips, we know you can do it! These kits do go in and out of stock quite regularly on Amazon but I placed my order while sold out and received it around a week later. 9 Comments on "The Best Value Way to Start Your HomeKit Smart Home Setup"
I like the bulb and dimmer kit as you then also get the remote dimmer too which is actually very good and looks great. Ideal for manual wall control which has been missing for a long time with the Hue system. If you set it to control a Hue scene, you also get responsive dimming of that scene too – so for instance, you could control a ceiling lamp, table lamps and maybe a couple of Hue Iris lamps too – all on the same on/off and dim switch. Very cool and easy. The v2 Hubs or B22 starter kits are out of stock everywhere even on the Philips web site. Currys & PC World are out of stock. It seems to be mid January 2016 before they are going to come back in stock @ John Lewis etc. @Simon – thanks. I noticed the £59.99 one came back into stock briefly this morning on Amazon before going out again. So have you moved over to smartthings from Indigo? If so, I think a new post on how you changed and why would be a good read. @Christian – I’m still running Indigo but have bought a SmartThings setup to have a play around. More on this coming over the next few weeks, particularly the issues around which systems support which Z-Wave devices. I use OpenHab and am Starting to feel that the best way to go is to find something like SmartThings to handle the hardware interaction, but control from OpenHab for rules and other bindings that won’t be supported by SmartThings. I’m just about to add some Philips lights in as I think they’re cheap enough now as your post suggests, might try SmartThings as well. @Christian – thanks, not a bad idea. Love to hear how you get on. Alas, that kit is “temporarily out of stock” at Amazon.